Photo Slideshow Director HD enables you to add background music for your slideshow. 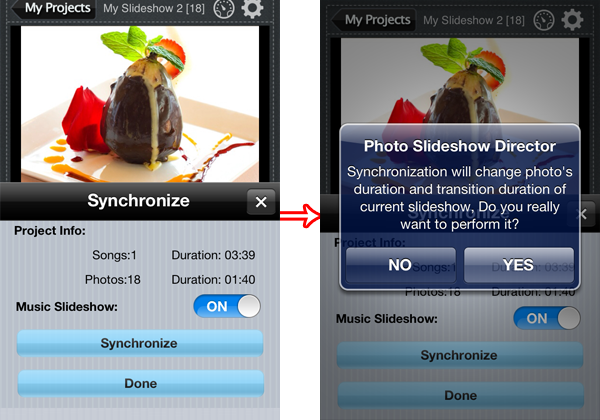 You can add one or more songs to a slideshow, then sync slideshow to music to keep them play in pace. Tap Music tab from the menu bar. 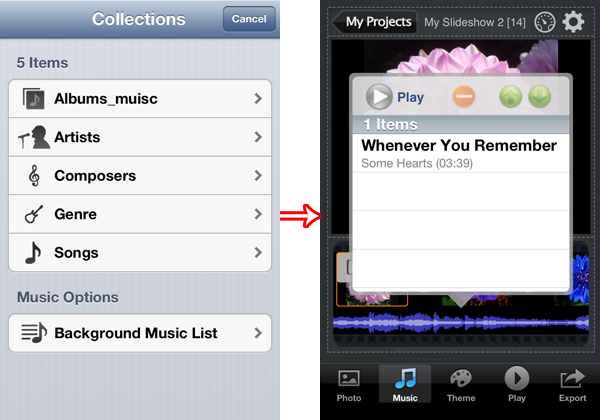 In the Collections window, choose songs from iPhone Music Library by Albums, Artiests or others. Tap Background Music List to organize songs you have added.You can play, delete the added song, or arrange songs order. If the slides showing time is longer than music playing time, the app will automatically repeat songs to make it match slides duration. However if the slides duration is shorter than music duration, you could use the synchronization to sync slides to music. Tap the clock icon at right top next to gear icon. Toggle Music Slideshow ON / Off slider to ON. Tap Synchronize button and tap YES in the dialog box.